The state’s newest wilderness area delivers beauty with rugged solitude. Step into the Sabinoso. Above: Largo Creek, in the Sabinoso Wilderness, eventually trickles into the Canadian River. Photographs by Claire Antoszewski. THE NORTHEAST CHUNK of New Mexico—from Las Vegas to Clayton and up to the volcanic cone field near Capulín—is transitional land. This is where the headwaters of the Canadian River tumble out of the Rocky Mountains toward the Great Plains, en route to the Mississippi. Take a north-facing seat on an Albuquerque–Dallas flight and you can see the high mesa country break into the plains below, unfurling into spectacular caprock canyons. For eons, the flat strata of the Canadian Escarpment have towered more than 1,000 feet above the plains, but only recently has this marvel, just 50 miles east of Las Vegas, been feasibly accessible to the public. Back in 2009, the 16,000-acre Sabinoso Wilderness Area came under federal wilderness protections—no bikes allowed, no cars, no motors whatsoever— but private land surrounded it. The only way in was by getting permission from landowners. Hardly anyone ever did. In 2011, the Wilderness Land Trust bought 4,000 acres of adjoining land, the Rimrock Rose Ranch, in hopes of providing public access. Last November, the Bureau of Land Management accepted the trust’s donation of the needed land, and paradise was suddenly within reasonable reach. That said, the wilderness is still beautifully remote. Only one access road leads into the Sabinoso: San Miguel County Road 51A. At the small settlement of Trujillo, 30 miles east of Las Vegas, 51A leaves the blacktop highway. In good weather, the trailhead sits a half hour from the intersection; in bad weather you shouldn’t try it. Even under blue skies, the road is no picnic. A Subaru Outback will have no problem making the trip, but its undercarriage might collect a few battle scars. As with so many other cherished places in the state, the Sabinoso is hard to reach, but absolutely worth it every time. As you approach the canyon, a first glimpse eases any misgivings about the new road’s rougher parts. From the trailhead parking lot at the end of 51A, the high plateau of the Canadian Escarpment looks like it’s been unzipped to reveal the flat creek bottom and an inkling of the Great Plains, far, far below. Cañon Largo, the massive erosional scar that dominates the Sabinoso Wilderness, stretches northeast, all the way to the horizon. When you get out of your car, the wind will probably be blowing from the west. So testify the gnarled junipers that hang over the canyon walls. The junipers—old, impressive specimens that have been growing downwind since Native peoples used this route as a thoroughfare between the Great Plains and the Puebloan settlements of the Río Grande Valley—serve as the namesake of the area. Sabin, often spelled savin, is a juniper species found in Spain. The trail from the end of CR 51A is the only way into the canyon. 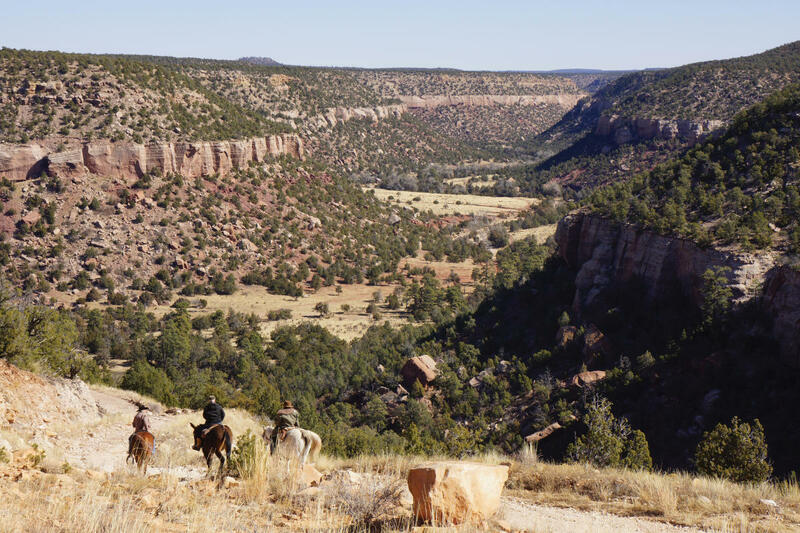 In the past, Spanish sheepherders, gringo horse thieves, cavalry patrols, and others found a handful of ways to skinny up the canyon sides, but those old trails now lie on private land. The trail from the parking area drops into the canyon through shale and sandstone layers. An overlook a quarter-mile down the trail is no place for toddlers or overly exuberant dogs, but the view is stunning. Once you arrive at the bottom of the old grade, you enter a secluded canyon. It’s full of thorns and mountain lions, dry in the summer, and cold in the winter, and it boasts more rugged beauty than you could lay eyes on in a solid month of walking. Above: Riders descend into the newly accessible Cañon Largo using the only mode of transportation allowed. THE SABINOSO LIVES UP TO its wilderness designation. Every crack and crag in the cliff lines looks like a good place to spot a cougar. The slopes are covered in cacti. Rattlesnakes thrive. In most places, you can’t traverse the sheer sides of the 200-foot-thick layer of sandstone in hiking boots, much less on horseback. But at the bottom of the canyon, along the lush riparian zone of Largo Creek, a veritable Eden awaits. Where the walls draw back from the creek, the grama grass meadows feel like a North American savanna. Huge junipers grow straight and correct in the clearings. Cottonwood trees line the creek’s edge, and where it widens into pools you can see cliff swallow nests in the sandstone overhangs and brilliant green watercress in the riffles. Even if the wind blows a gale over the canyon rim high above, the reeds on the floor will hardly stir. But ask Fred Romero, who’s spent enough time in the canyon to see most sides of it, and he’ll tell you: Be careful. It’s not always un paradiso down there. As in all canyon country, you need to look after yourself while in the hole you climbed into—especially since there’s only one way out. Noted: Never camp in the lowest places of Cañon Largo when there’s even the slightest chance of rain. You can find countless sites to put up a tent above the creek, but the bottom 20 or 30 feet make for dangerous territory during the summer monsoons. A few miles from the trailhead last winter, a 30-foot cottonwood log sat atop a rock that was about the size of a one-story house. Loftily marooned by floodwaters the previous summer, the log gives the same testament as the horizontal scratch marks some 30 feet above the creek. They look like glacial striations but are actually gouges from rocks and other debris surging down Cañon Largo. People have lived permanently in the canyon, though—mostly Spanish sheepherders who arrived in about 1870. Nearly all the evidence you can see of those settlers is above the high-water line. History hovers near the surface throughout New Mexico. Buildings, forts, churches, and cliff dwellings turn to ruins yet stand for hundreds of years in our dry climate. You can see them at national parks and in cattle pastures beside the highways. And usually, in more ways than are at first visible, the history survives in the people who live there. It certainly does in the Sabinoso. THE OPENING OF THE SABINOSO Wilderness drew applause from a lot of angles. New Mexico senators Martin Heinrich and Tom Udall both waxed optimistic about the hunting opportunities. 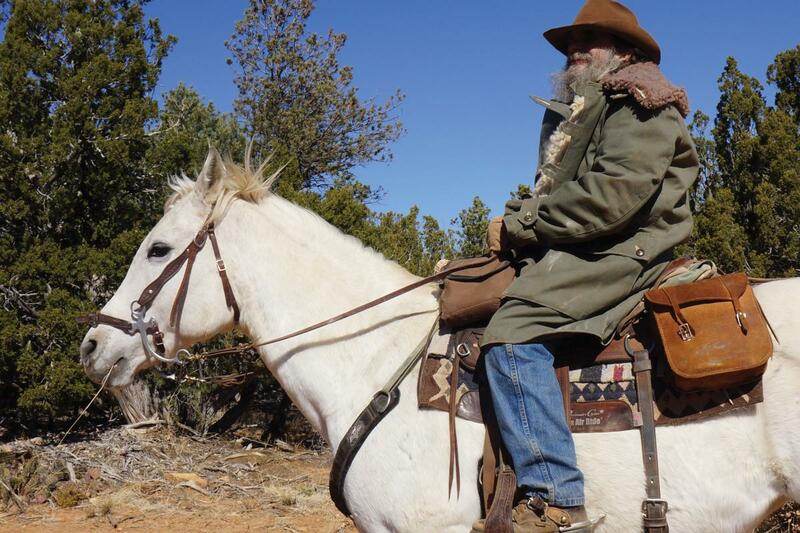 Coalitions of horseback riders cheered the additional miles of trail to see from the saddle. One website even lauded the possibilities for fishing. The truth is that the hunting opportunities are scant. Elk haven’t lived in the canyon for 50 years or so. Nor is there a public-land elk-hunting tag available for the area. You can hunt the turkeys, but the deer are struggling under an increasing mountain lion population. The lions, which you can hunt, with a permit, long ago cleaned out the Barbary sheep. In short, hunters can find better places in the state for putting meat in their freezers. The same is true for fishing. Largo Creek, which runs into the Canadian River where the town of Sabinoso meets the mouth of the canyon, is an intermittent stream. Its hydrology includes sections where it runs underground. It’s hardly big enough to cast a line in, and though Native Americans may have trapped fish in its side pools for eons, doing so today would reveal a lack of appreciation for the sensitivity of our desert waterways. Above: Ben Bailey rides Dulce. So it’s best to see the Sabinoso Wilderness by horseback or on foot. Either way, the trail in is the same as the trail out. You can’t hike a loop, and you can’t park your car at one end and walk to the other. But you can follow that trail to the uniquely New Mexico experience in the canyon below. Once you’re in it, slightly less than one mile from the trailhead, the rest of the route is mostly level. The trail loosely follows the creek, but sheep, cattle, ranchers, sheepherders, and Native Americans carved many other paths. Cavalry soldiers also used the canyon as a wagon route between Forts Bascom and Union. They left bullet marks on the sandstone walls, but never lingered beneath the canyon rim for long. Families such as Fred Romero’s came after the twilight of the Old West and settled the canyon floor and the mesas above. In the 1930s, Dust Bowlers who were headed toward new lives spent a stint in the area if they ran short of money, food, and anything but labor to sell. There, they worked for people like Romero’s father before moving on to the Las Vegas area and beyond. The land is just as wild and rugged today as it ever was. Yes, the road to the trailhead is new, slightly raw in places, but it’s open and maintained. BLM wilderness area restrictions mean that you won’t hear the whine of ATVs or automobiles, that no bikes are allowed on the trails, and that all camping is primitive—no established sites, no facilities. It’s open all year, but be cautious during monsoon season—roughly the Fourth of July through the middle of September. In spring and autumn, the canyon floor will feel 10 degrees warmer than the windy rim. In winter, snow never lasts for very long, and the rock walls retain the sun’s heat into the night, just as they did for the Native peoples who left behind their fire pits and pottery shards. Spend two nights in the canyon. You’ll hear owls ping echoes off the sandstone walls and frogs chirping along Largo Creek. You probably won’t hear—or even see—the mountain lions, but they’re there. The Milky Way will gleam as sharply as you’ve ever seen it. And if you don’t leave there a happier person, stay for one more night. It worked for me. 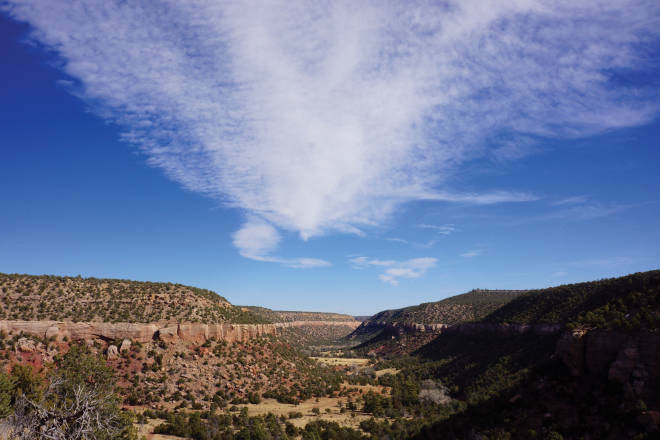 The opening of the Sabinoso Wilderness puts another corner of the Land of Enchantment within your reach. From Las Vegas, New Mexico, it will take an hour’s drive to reach the Cañon Largo Trailhead into the 20,000-acre wilderness. The area is undeveloped: Bring plenty of food and water. Let people know where you’re going and when you’ll be back. Camping, hiking, horseback riding, and dogs are allowed. No motorized vehicles or mountain bikes. Observe all hunting and fishing restrictions. Maps are available at the Bureau of Land Management (226 Cruz Alta Road, Taos, 575-758-8851, nmmag.us/sabinoso).